A day early, because I won't be able to get to it tomorrow. This is the most bland post ever. I've sewn a few more rows on the body of the quilt, but it basically looks the same as last time you saw it. Dang! I've been doing other things this week and it was low on my list--right now I'm supposed to be packing for a weekend trip, but instead I'm updating my blog. I really hate packing and loading the car, especially by myself. I promise next Friday, you will get some good progress on that thing. I'm really looking forward to picking out a back and starting to quilt, but I'm getting ahead of myself now. Check back next week for some new pictures. 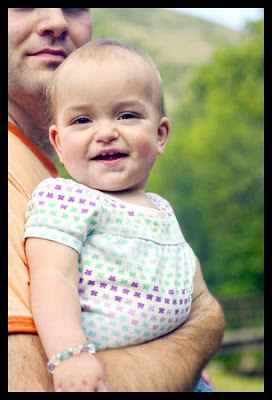 :) I'm going to leave you with a picture of Aubrey wearing one of the outfits that made it into the fabric of the quilt.